If you are working with Oracle BPM 11g and Oracle WebCenter 11g technologies, definitely you will be interested to join these two together and create enterprise portal. 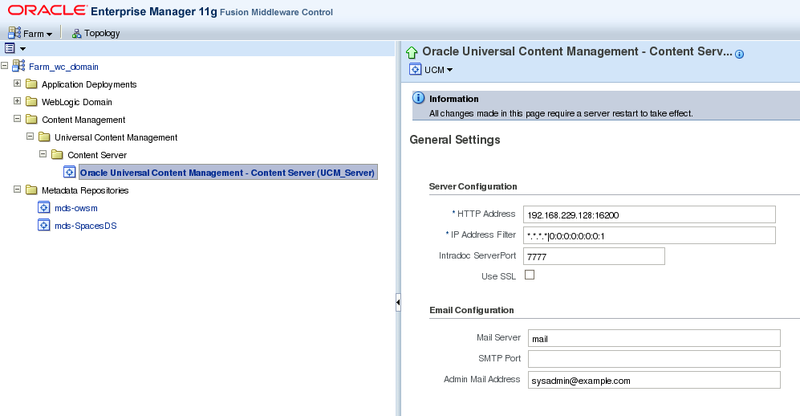 Such integration became available with Oracle Fusion Middleware 11g PS2 release during the last year, see technical steps to make this integration work - BPM Portal - How To Configure Oracle BPM 11g Process Portal on Oracle WebCenter Spaces 11g. 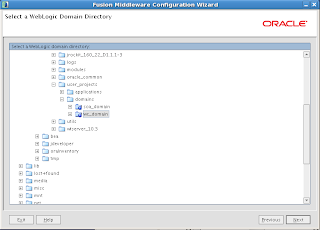 With Oracle Fusion Middleware 11g PS3 being released few weeks ago, there are some changes in this area - mainly configuration part, overall features are still the same as in PS2. 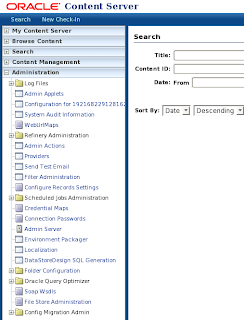 In PS3, they moved all Oracle BPM process portal related content into WebCenter domain, before it was in SOA domain. 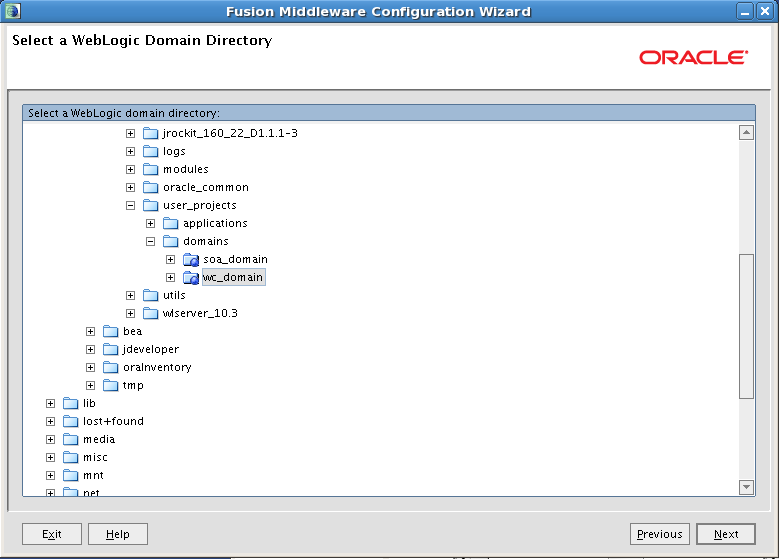 However, build script and properties file still remains in SOA domain. Its very important now, to setup UCM and WebCenter Discussions services properly - otherwise BPM and WebCenter mapping process will fail, it was not so critical in PS2. Ok, let's start from the beginning. 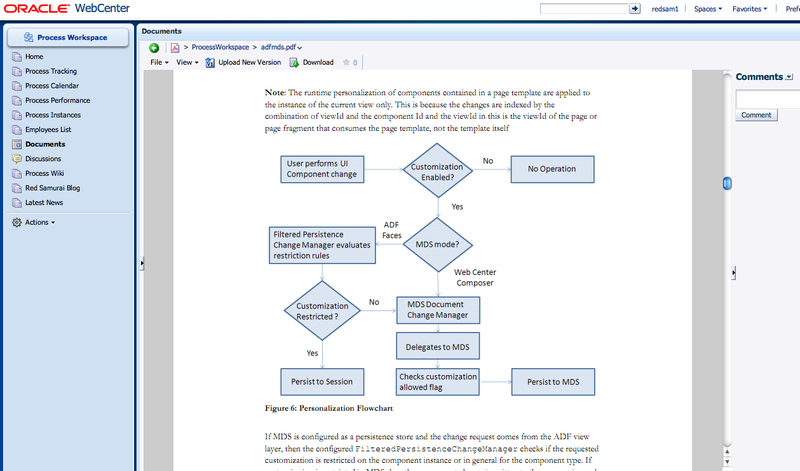 You need to complete two steps described below, before you will run BPM and WebCenter integration script as per documentation (5.5.2 Enabling Process Spaces in a WebCenter Domain). 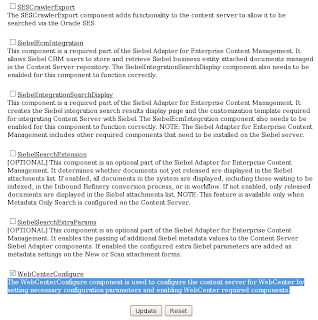 For Oracle BPM and WebCenter integration in PS3, you still can reference blog mentioned above for PS2. There are few extra steps specific for PS3, I will explain these now. 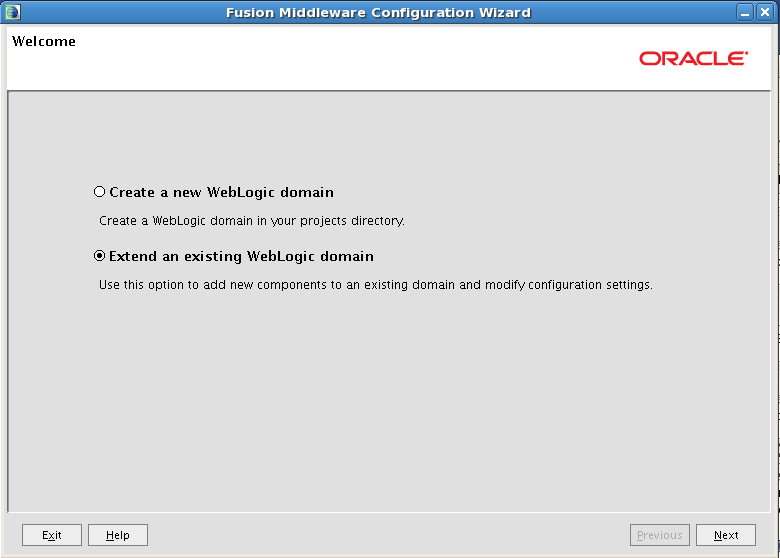 Now WebCenter domain will be extended with Oracle BPM Spaces product. 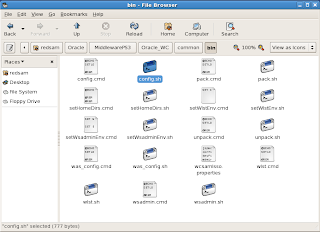 I decided to set UCM RIDC port to 7777 and allow access to all IP's *.*.*.*. You are free to choose your setting here. We are done with the second step now. 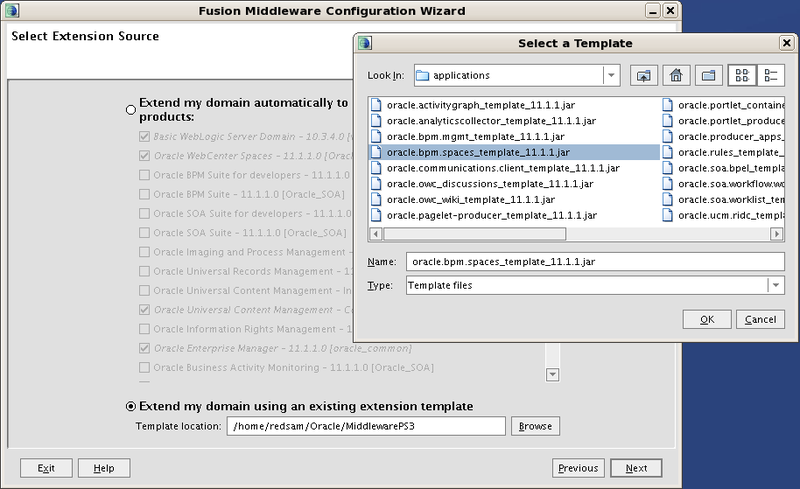 This is a request to write a blog on 1) Integrating Spaces API with Standalaone java. What i am looking for is to create a webservice which inturn will talk with Webcenter Spaces API to create space, create new custom role, add members, assgign permissions. 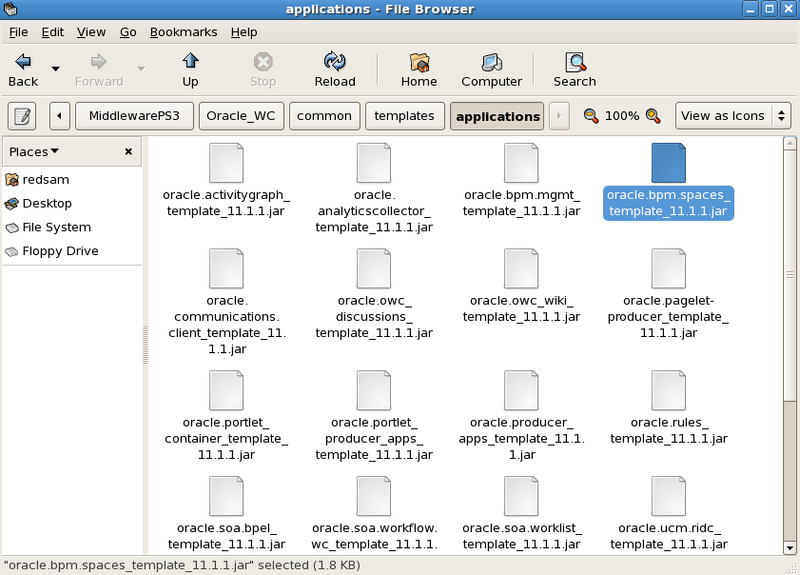 In Short to automate the space creation from Java class. Yes, I'm working on those topics as well. Stay tuned. 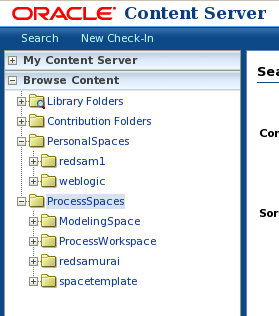 Why in my installation of webcenter and ucm 11g ps3 "PersonalSpaces" and "ProcessSpaces" folders not exist?! 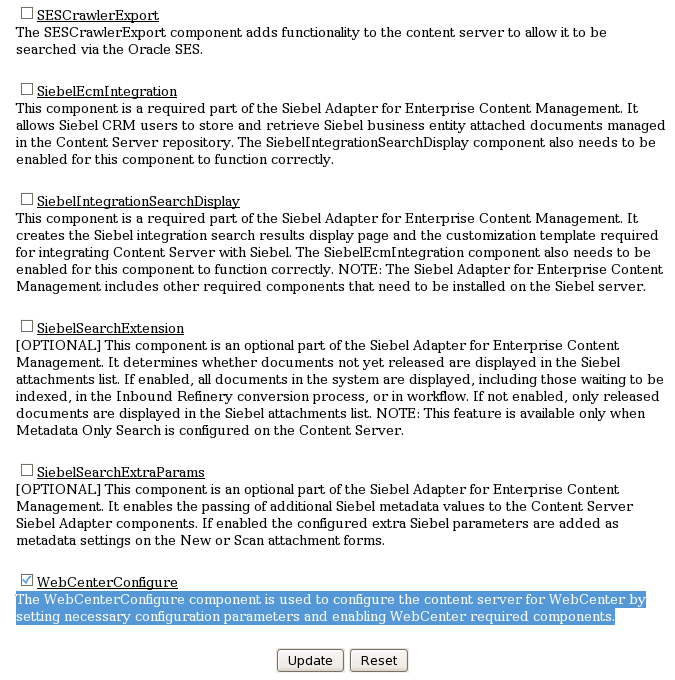 It will not exist, it is created during WebCenter/BPM extending process. yes, I re-install everything from scratch, folders is created during WebCenter/BPM extending process.but in new Installation, after run ant command line, in my webcenter when i click on "Process Workspace" or "Modeling Space" error occurs. If the error persists, report the problem to your administrator. I am grateful to the your proposal to solve that. I've gone through the install it all seems fine apart from when I try to add a task list to a page I get the following error. 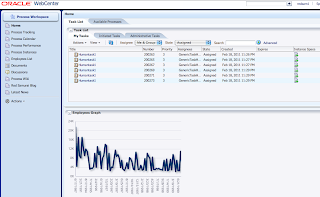 You can open Process Workspace successfully? While working with spaces I found that the Space has a limitation of having only one role per user. 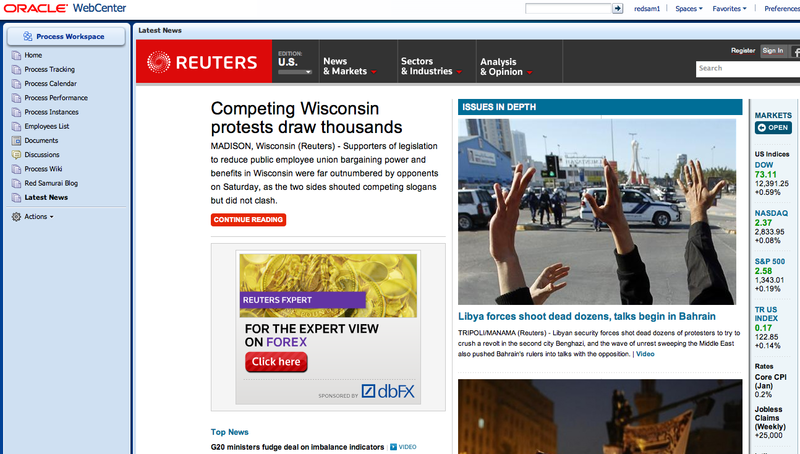 While the underlying OPSS does not. Is there a way to hack this or a way around this. As our application business is heavily dependent on multiple roles at a space level. 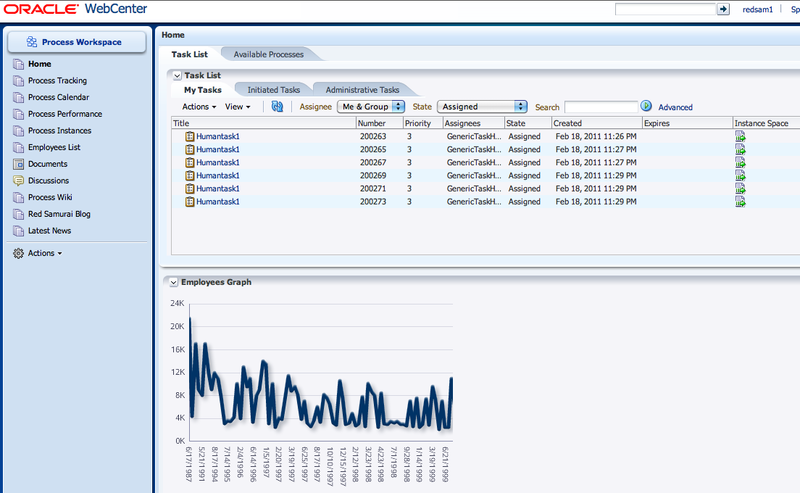 As of now I have a work around for this by using a new Table in Database. But this makes the design more messy and OOB usage very limited. Please let me know your views, Is there a better approach I can take for the same. 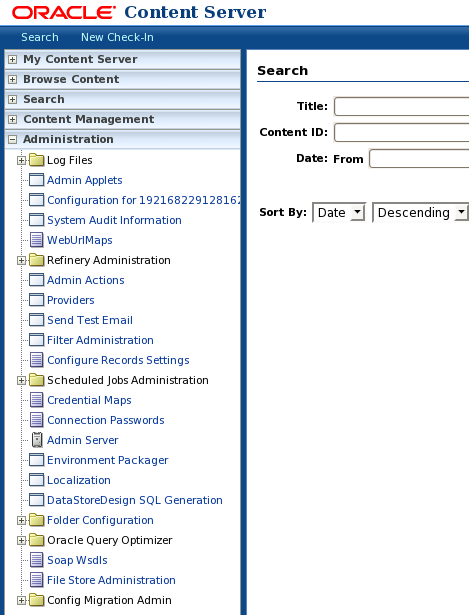 I'm not sure what you mean one role per user in WebCenter Space. I think user can be granted multiple roles? Can you explain your use case? What I meant was, For a "Space" we can assign only one role for a user. If I create a new Space, create two new space roles for this space, then I can assign only one role to the user when adding member into the Space. ( Its a combo box that comes to assign). My Use case is, "Space" symbolizes a "Publication Article", so typical roles at this space would be Author, Editor, Reviever, Chief Editor. Now If I have a user who can perform both Editor and Chief Editor tasks on this. Then how do we do it. Okej, I will need to think about it :) On my todo list. 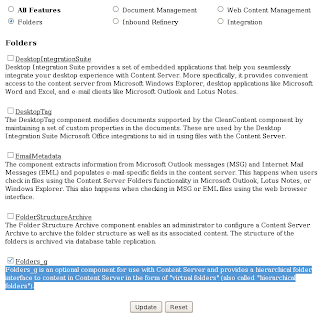 May be, if you will modify configuration scripts. But its supposed to be installed and configured with UCM. Hello - I am having a problem with configuring. I followed the PS3 steps of extending the domain and running the ant scripts as noted in the document. 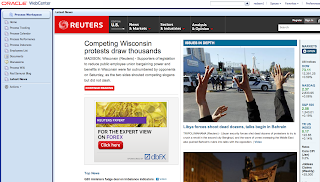 Howver, when I restart webcenter I have the corrent spaces created but they are empty.. 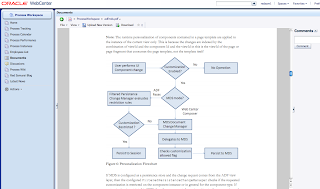 When I try to add a taskflow to a page, I see the new BPM taskflows but I recive the following error when I try to add to a page. 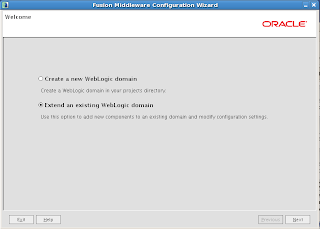 Caused By: oracle.mds.core.MetadataNotFoundException: MDS-00013: no metadata found for metadata object "/WEB-INF/processApplicationsTaskflow.xml"
Do you know what's wrong? Regards and congratulations for this useful blog. 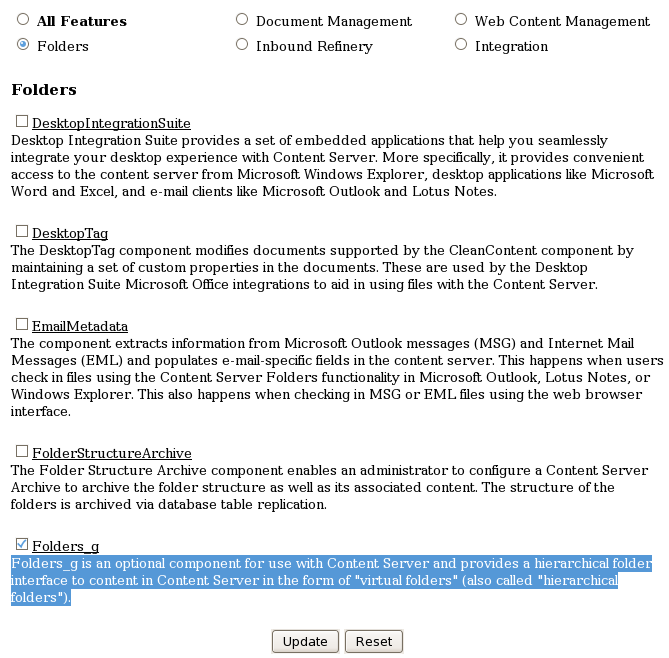 @Tim - I've seen this when the WebCenter domain was not extended with the BPM Spaces domain template. 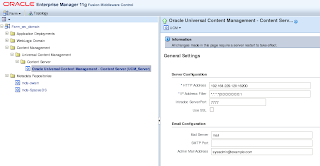 "Caused by: oracle.adf.controller.ControllerException: ADFC-02001: The ADF Controller cannot find '/WEB-INF/taskList-task-flow-definition.xml'." The error goes off and the application runs fine when i add the jar files - adflibTaskListTaskFlow.jar & adflibWorklistComponents.jar directly to the project's classpath. 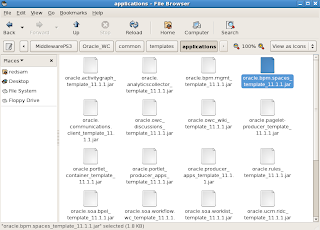 My question is why the application is unable to find the taskflow's xml file when we have the jar files as a part of the Library 'BPM Worklist Components' and it is working when we add direct references. Please explain.